Deciduous shrub or small tree up to 10 m tall with yellow- to brownish hairs, bark silvery-grey. 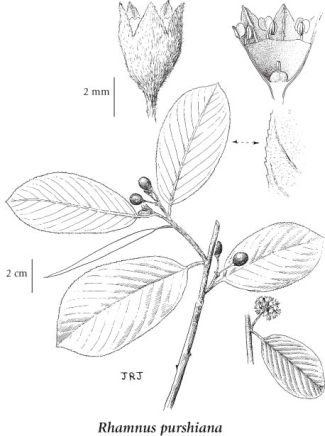 Alternate, egg-shaped to broadly elliptic, the blades 6-13 cm long, finely toothed with 10-12 conspicuous pairs of parallel veins, the veins short-hairy; stalks 5-23 mm long; stipules lacking. Inflorescence an axillary, stalked cluster of 8-25 male and/or female flowers; petals 5, greenish, hooded, 3-4 mm long; hypanthium lined with a thin disc; calyces 5-lobed, the lobes triangular, finely hairy. Moist to mesic streambanks, thickets, woodlands and forests in the lowland, steppe and montane zones; common in SW BC, frequent in SC and SE BC south of 51degreeN; S to ID, MD and CA.